Damien Chazelle’s feature, First Man, about the United States’ effort to land a man on the moon, took home the Oscar for the Outstanding Visual Effects category. Paul Lambert, part of the team who took home the Oscar in the category for Blade Runner: 2049 shared insights into the multitude of VFX techniques to create the film's realism. "First Man is a production in which we redefine shooting 'in camera'. Those words generally imply everything is shot practically, which we creatively did. We had to create a gentle balance using a diverse mixture of visual effects, special effects, archival footage and scaled models to help create the 1960’s documentary-style film that was the Director's vision. 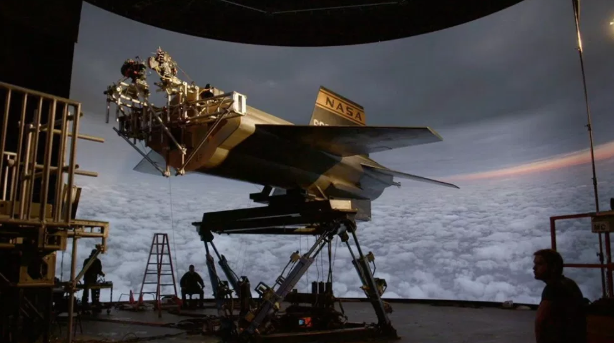 The biggest challenge was how to shoot certain space and in-flight elements with our CG content to fit within the boundaries of a film being shot with 16mm & 35mm film. "The effects had to be subtle and shot in a particular way to make it feel like footage from the day. Anything that felt like heavy VFX would have completely taken you out of the story and be glaring out at you. With the various crafts in the movie, we tried to stick to a simple philosophy. "Depending on the size of the craft in the frame is when we would design the shot to either use the full-scale practical, 1/6 scale miniatures or the full CG version. We shot full-scale practical crafts with the actors on 6 axis gimbals in front of the curved 60-foot diameter and 35-foot tall LED screen. Using 90 minutes of VFX content that was created at DNeg we were able to create a pseudo full three-dimensional world in-camera. "We rendered full 360-degree spherical images to be played back on the screen that gave us the greatest flexibility on the day. The playback system allowed for interactive rotation and color grading as we filmed. Having entire sequence backgrounds in the camera while shooting rather than being made in post after the shoot not only added to the believability of the scene with interactive light and reflections it undoubtedly helped the actors. They could actually see and react to what was in front of them. 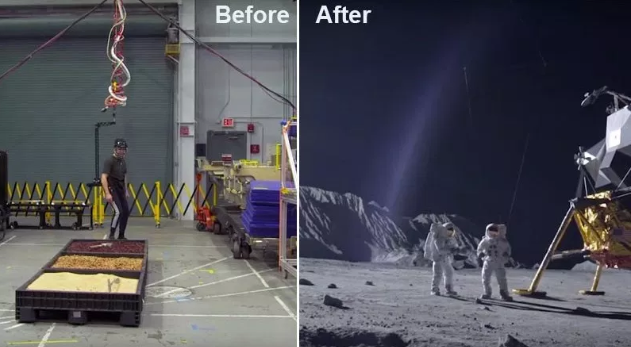 "In our search through NASA resources, we came across some Apollo launch footage shot on an obsolete 70mm military stock that had never been seen before. Some of those visuals we had to recreate with CG but others we augmented to fit within the parameters that we were shooting. At the core of those scenes we retained the original material but we reframed it, cleaned it up and extended them on each side with matte paintings and CG. "The movie ends with 9 minutes of full frame IMAX footage which was meticulously cleaned up and extended including one shot where we transition from 16mm to 70mm film as we travel out through the portal door. The post work was done at 6k and every visor was retained but had to be cleaned up because at this resolution you literally can see everything." Take a look at how First Man came together visually.